Shorts and short-sleeves in February! An all-indoor 5K race could be considered a gimmick… but if that’s what this was, it was a well-timed, themed and orchestrated gimmick. There are plenty of Chicagoans (this one in particular, until recently) who love to run, but don’t necessarily love it enough to intentionally sign up for any race that takes place outside during the coldest time of year. This first annual indoor 5K provided a smart solution to this problem, and a sizable population turned out to enjoy it. An initially fumbled commencement (“Let’s get this race started with a countdown! Three… nevermind.”) left a few minutes of confused chuckling before the actual countdown launched the first wave of runners (those planning a six-to-seven-minute pace). From there a new wave was released every two minutes onto the maze-like track. The smooth pre-race organization of waves along with the wide course managed to keep an indoor race with around 2,000 participants from ever feeling cramped. 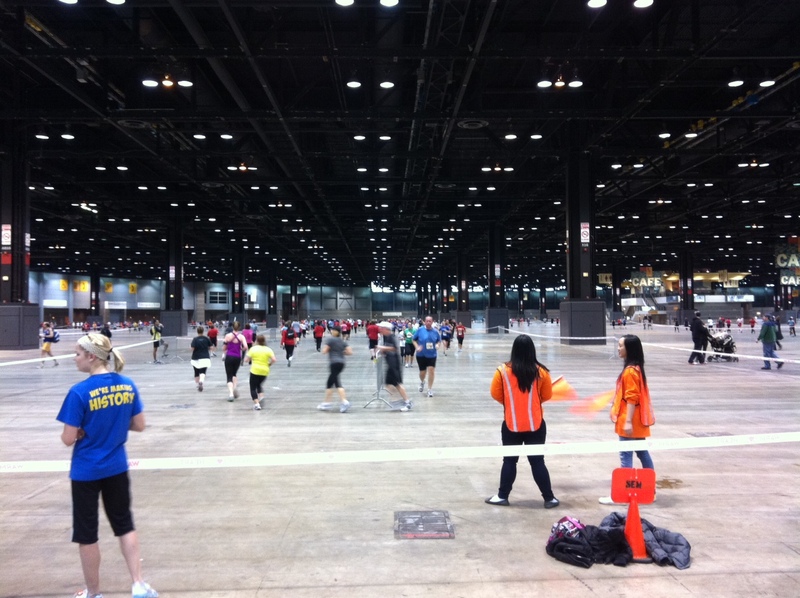 Part of the allure of the Warm Your Heart 5K was the touting of Chicago’s first single-loop indoor course. McCormick Place is a monstrous building, but course designers still worked wonders creating a full 5K trail where runners never retraced any steps, without winnowing the run lanes down too much. However, this accomplishment also meant that the course could probably break a record for the most u-turns in a single 5K route. Additionally, with so many quick turns, a water station at the midway point felt a little unnecessarily risky, considering that the floor was finished concrete and most runners dropped their half-empty cups on the ground after a few swigs (still, I didn’t see anyone slip). Course: 4. A winding maze through McCormick Place. Lots of u-turns, but that’s the trade-off for never retracing your steps. Organization (bag check, etc. ): 4. Bag-check volunteers seemed a bit harried before the race, but retrieval was a breeze. Packet pick-up and starting corrals were well-orchestrated. Goody Bag (includes shirt): 3. Quality shirt material and nice design, but making the shirt unisex led to odd sleeve lengths. Not much in the goody bag, but an extra point for a heartfelt letter from the director of Northwestern’s Bluhm Cardiovascular Institute. Weather: 5. You can’t really beat indoor weather in February! Overall: 4. Recommended Race. Whoever came up with this concept is to be commended. An enjoyable maze and an interesting way to experience a building that’s typically filled with organizational booths.